Be the first to share your favorite memory, photo or story of Ottilie. This memorial page is dedicated for family, friends and future generations to celebrate the life of their loved one. 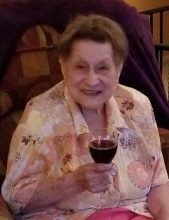 Ottilie “Tillie” Beer Neary, age 92, died peacefully Monday, March 18, 2019 at her home in Aberdeen, Maryland. She was born in Wunsiedel, Germany, the youngest daughter to Josef Beer and Therese Margarethe Beer (nee Rothenberger). She was sister to Anne Beer Bayer, Hans Beer and Karl Rothenberger. She was the wife of the late Charles William Neary. She is survived by her daughter Elaine Kathleen Neary, of Aberdeen, nieces and nephews in Germany and Chicago, Illinois, friends and her three “shnookies” - the granddogs, Mickey, Minnie and Noah “Pooh Bear”. Mrs. Neary grew up in Wunsiedel, Germany. After graduating high school , she worked for her Aunt and Uncle in Munich, Germany, as a nail technician. It was on a blind date that she met Charles “Charlie” Neary, a soldier in the Army. The couple married August 31, 1956 and moved around the world in support of his career in the Army. She became a naturalized American citizen on February 14, 1958, at Fort Benning, Georgia. In August 1972, they were assigned to Aberdeen Proving Ground, MD. It was here that Mr. Neary retired in 1974 and they built their life. Tillie was a devoted wife and mother. She was a member of St. Joan of Arc Catholic Church for the past 47 years where she was active with the “Church Ladies” group and fundraising for the church. She loved to visit with her friends and enjoyed all things German, including the other German Ladies in Aberdeen, yodeling, fine German cuisine and, breaking with German tradition, her nightly glass of wine. She was dearly loved by her grandpups as she always shared her nightly ice cream with her “shnookies”. A visitation will be held at the Tarring-Cargo Funeral Home on Tuesday, March 26 from 6pm-8pm. A Mass of Christian Burial will be celebrated by Father William Franken at St. Joan of Arc on Wednesday, March 27 at 10:00am. Tillie will join Charlies at Arlington National Cemetery at a later date. Those who desire may send contributions in her memory to St. Joan of Arc Catholic Church, 257 S. Law St., Aberdeen, MD 21001, or to the Humane Society of Harford County, 2208 Connolly Road, Fallston, MD 21047. To send flowers or a remembrance gift to the family of Ottilie Beer Neary, please visit our Tribute Store. "Email Address" would like to share the life celebration of Ottilie Beer Neary. Click on the "link" to go to share a favorite memory or leave a condolence message for the family.